Jack Abraham's HS team (Oxford MS Chargers) won their first scheduled game against Southaven 35-0. (Last week's game was a jamboree). Southaven is a class 6A opponent from the metro Memphis area that went 11-3 last year and advanced to the second round of the 6A playoffs before falling to Oxford's next opponent, Starkville. Jack completed 26 of 43 passes for 343 yards for two scores. He also ran for a touchdown. Remember that Jack's team travels to Starkville next Friday in the Little Egg Bowl. The game will be televised nationally on ESPNU starting at 8pm. This kid looks fantastic. If we can hold on, the Tanner Lee-->Jack Abraham pipeline will be as good as anything since King --> Ramsey and put us back in the QB U conversation. Lol. Tanner Lee has done nothing to be in the same sentence with King or Ramsey. This year is his chance to prove himself. Lester Ricard and Ryan Griffin were better than Tanner Lee so far too. Don't forget...you can watch Jack Abraham tonight on ESPNU as his high school Oxford Chargers take on Starkville in the Little Egg Bowl. Silly. Please compare numbers for their respective FRESHMAN seasons, in which case he looks to be right there. Also, this kid is far from a solid commit. We need to hold on here. jonathanjoseph wrote: Also, this kid is far from a solid commit. We need to hold on here. Ya, I love that he is playing big time games but don;t like the exposure he will get if he plays well. I think his size still scares away a lot of programs. I didn't get to watch last night. How'd he do? How'd he look? Tanner Lee had a better Freshman season than Shaun King or Terrance Jones. Ya'll are upset with Lee's season because he didnt perform like Manziel or Winston did. 2 of the best college QB's in the history of the game. There is more than enough time for Lee to turn out to be a great QB at Tulane. DfromCT wrote: I didn't get to watch last night. How'd he do? How'd he look? If I had to answer in a word, I would say 'disappointing'. However, the Oxford team looked like boys playing against men compared to Starkville. Oxford lost 20-7 and Jack had little time to work under the constant pressure of the great defensive line from Starkville, reported to be the best in MS. Three Starkville DLs have FBS offers. Jack finished 15 of 28 for 115 yards with an interception. He had a number of drops, but seemed out of sync with his receivers due to the heavy pass rush. I would be very interested in a critique of Jack's mechanics from winvave or WaveQB. A J Brown, the WR from Starkville, looked all-world. Brown has offers from Alabama (and everywhere else) and is ranked in the top receivers in the nation. He caught 16 passes for 200 yards. He would really look good in Tulane green. Porter writes that Jack is giving Cal more consideration fearing a 'wholesale coaching change' should Tulane have another losing season. Some of this is probably speculation. However, if I were Jack and had an offer from Cal, I'd have to seriously consider it. In response to JaxWave's quote that Jack looks to be 5'9", I suggest that he trade in that 17" TV for something bigger. Jack's no big man but is reported at 6'. I suspect that he is 5'11". Here's a pic with Coach Johnson and the Prices. He's obviously taller than our Johnson (sorry...couldn't resist that). I only saw a part of the game. As has been noted his line was overmatched. He never really got a chance to throw the long ball. He's probably 5'10'-5'11' and needs to put on some weight to withstand the hits he'll take at this level. He will definitely need time to develop once here. Recruiting wise I would keep looking. winwave wrote: I only saw a part of the game. As has been noted his line was overmatched. He never really got a chance to throw the long ball. He's probably 5'10'-5'11' and needs to put on some weight to withstand the hits he'll take at this level. He will definitely need time to develop once here. Recruiting wise I would keep looking. We need to keep looking. Reminds me of Anthony Scelfo but without the moxie. In fairness his receivers were horrible. I mean absolutely horrible. Not sure what his stats were but I saw at least 10 drops. Can he be the next Doug Flutie, I don't see it. He was the smallest player on the field for both teams. You can easily fast forward to when his team has the ball. Go to Football, then Replay, then last 7 days to find the game. No doubt I was being polite. Even when I'm polite I get called out. Thanks Green Lantern. Respect here. As I said about Tanner Lee, this kid has the tools to be a good QB, but he needs a good QB coach to make him a division I QB. We need to continue to search. Maybe the Hontas QB at Jesuit would be a good "get" down the line? Or maybe that one time was just not his day. swampnik wrote: Maybe the Hontas QB at Jesuit would be a good "get" down the line? That's a tough question. No doubt Peter is from great stock. He's now a senior and will finally get a chance to start. Most schools like to evaluate kids by their Jr year. Peter only took a few snaps last season so it's difficult to know at this stage. We'll have to see how he does the rest of the year. I'm a big fan of the Hontas family and Jesuit so I hope he has a great Sr season. Hontas on film looked pretty good last night. Looks to be a tough kid. Thanks. Would love to see us have another Roch. Like Montana his dad has the means. He should be sent to work w/a QB guru to correct his flaws in his throwing motion which aren't as obvious as Montana's and he could play somewhere. Jack's team, the Oxford Chargers, lost a nail-biter to no. 4 ranked Madison Central on Friday night. Even with Jack passing for a school record 485 yards and 3 TDs, the game was decided at the end by special teams. With less than two minutes remaining, Oxford closed the gap to 31-27 when Jack led a 90 yard drive ending with a 10-yard TD toss. Oxford's coach, Johnny Hill, decided on a two-point attempt. Jack made a halfback toss and then snuck into the end zone where he caught a pass for the conversion and the only catch of his high school career. The score was 31-29. With a little over a minute remaining, Oxford successfully executed an onside kick. Jack used all the clock while driving the team to the 13. Oxford unsuccessfully attempted a field goal and Madison Central ran out the clock. Oh well. 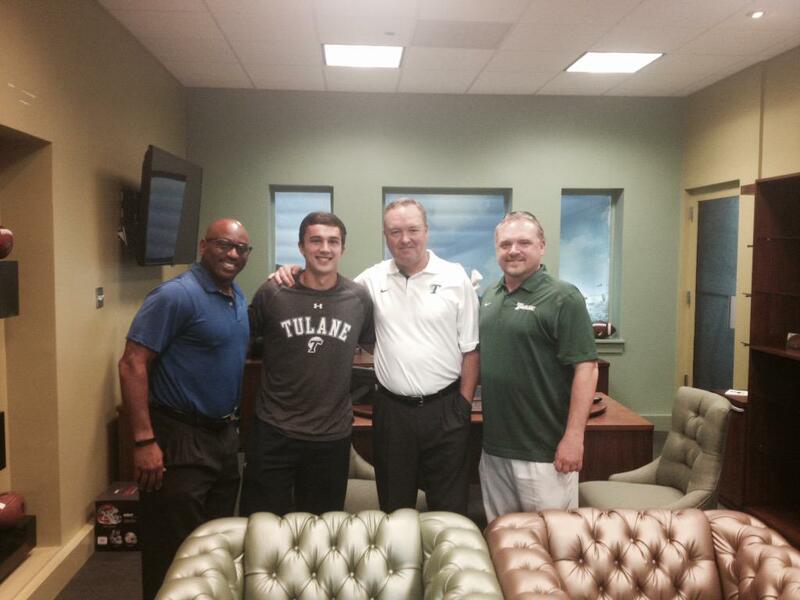 I think Jack will be very familiar with special team breakdowns when he gets to Tulane. sader24 wrote: Tanner Lee had a better Freshman season than Shaun King or Terrance Jones. Ya'll are upset with Lee's season because he didnt perform like Manziel or Winston did. 2 of the best college QB's in the history of the game. There is more than enough time for Lee to turn out to be a great QB at Tulane. Lee redshirted. King was thrown in after Ally got hurt in the 2nd game vs S. Miss his true freshman year. Jones played mostly RB his Fr year. Jones was the best Qb in Tulane history. If he had a defense like Tulane has now, with the points his offense put up, Jones would have taken us to a major bowl. Both of them knew how to avoid a rush. Tanner is too slow to get out his own way. Maybe Tanner can get his old OC from Jesuit to give him some pointers, because Price sure isn't helping him.